There are more than 128,000 New Yorkers with developmental disabilities, including intellectual disabilities, cerebral palsy, Down syndrome, autism, and other neurological impairments. The Arc of Putnam County, one of 46 chapters of The Arc of New York, is at the forefront in providing advocacy and programming for children and adults with intellectual and developmental disabilities. 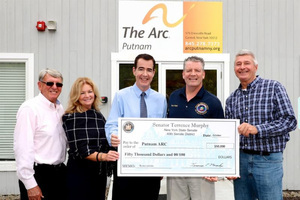 To help ARC continue its mission to empower individuals to achieve their highest quality of life, Senator Terrence Murphy recently secured a grant of $50,000 to ARC's Carmel facility.